At the Fountain, the Fraser River poured into a steep-sided, rock-bound trench that curved around the base of Fountain Ridge. They left Hat Creek and followed the well-marked HBC trail through a cut in the hills to Marble Canyon. From Pavilion Lake they followed “Pavillon” River to the banks of the Fraser River, where a Native village stood. You may question Anderson’s calling this creek Pavillon, but it actually carried that name — apparently for the ritual of the Natives who placed the bodies of their dead on elevated platforms decorated with cloth flags, or “pavillon.” However, In his writings, Anderson says that the river was named by the French Canadians for a British flag once conspicuously hoisted there; and in fact both interpretations might be correct. The natives whom I saw, amounting in all to about 50 men with women and children in proportion, were suffering for want of provisions, and were unable to supply us any. They ascribe the dearth to the state of the water, which impedes the usual fishing. The inhabitants are very miserably clad, and exhibit every symptom of abject poverty. They possess, however, some good cedar canoes, made after the model of those seen on the coast. After some parlaying I succeeding in hiring a couple of these, together with the necessary conductors. Embarked after 7 o’clock, and after proceeding three miles encamped on a low point at the entrance of a considerable lake trending off SE. In the months that followed the publication of my book, I received a few questions that I was unable to give good answers for at the time. The following question came from an anthropologist and archaeologist named Douglas Hudson. “I am really looking forward to your book,” he said. Then he told me the story of a Native man who remembered that, many years earlier, his many-times-great-grandmother had been hidden away for safety, because “some strange person was coming down the river.” Hudson figured out the generations, and thought that the stranger might have been Alexander Caulfield Anderson, on his 1846 journey down the Lillooet River to Fort Langley. I find the river very different from what I expected. At this stage of the water it is a perfect torrent; and at a higher stage (it is now at half-water) must afford a very precarious navigation. In fact, but for the expertness of our Indian boutes who are thoroughly versed in the intricacies of the river, we should, I fear, have had much difficulty in getting through. And that was a problem! When he wrote this, they had paused to set up camp at the head of a fall or rapid. The next morning they started again at 3 am, “and after passing with occasional delays a succession of rapids, connected by an impetuous current, we arrived at the second lake at 10.35.” This second lake was Harrison Lake, and they had enjoyed two days of rough river travel along the Lillooet! During his turbulent downriver journey, Anderson disqualified this river trail as a route for horses — now he is mentally eliminating it as a possible route for the boats the fur traders used. Even if they made their way safely down this river (which seemed unlikely), how would they ever come upriver again? So, for me the answer to Douglas Hudson’s question is this: His work was done when he decided the route would not work for the fur trade, and for that reason, he spent little time in describing or exploring the country. In addition, this is a business journal, and like his other journals of exploration, it has a specific purpose: to report back to the Board of Management at Fort Vancouver the route taken and its availability, nor non-availability, as a brigade trail for heavily laden pack-horses. The Native villages along the river were only important if they appeared to be a hazard to the brigades. 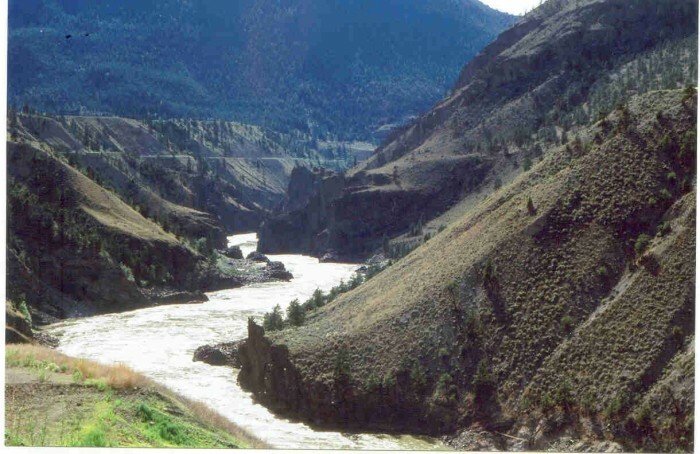 Moreover, I have the feeling he was travelling down the Lillooet River so quickly that there was little time to notice any villages that might have existed along this rapid-filled stretch of the lower river. Anderson never returned to the Lillooet River again, except when he came to Port Douglas — the short-lived town established at the lower river mouth in 1858. Port Douglas was the head of the Harrison-Lillooet Trail that ran over Anderson’s route, and took the gold-miners into the Fraser River goldfields by the thousands. It was never designed to be a horse trail; the miners hiked in with their provisions, and sometimes they had mules to carry their goods. A few gold-miners made their way upriver in their boats or canoes, and some lost their lives in its waters. Men had to be tough to travel over this road — but in spite of the Harrison-Lillooet Trail’s many difficulties and obstacles, it played an important role in British Columbia history. By the way, for those of you who don’t know the term in the last quote: “boutes” are the bowsman and steersman; the experienced canoemen that sit in the front and rear of the HBC boats and do most of the steering. I think Anderson was quite impressed with the Lil’wat Natives’ ability to handle their big wooden canoes in these rough river waters! I also have copies of “The Pathfinder,” for sale, so talk to me if you want it. My second book, Working Title “York Factory Express,” is now at my editor, and I have begun to write my third — Working Title, “Brigades.” This story will probably be a part of that book, although this part of the 1846 might not make it into the manuscript. Copyright, Nancy Marguerite Anderson, 2014. [Updated, July 26, 2015] All rights reserved.